(Nanowerk News) Denizens of oceans, lakes and even wet soil, diatoms are unicellular algae that encase themselves in intricately patterned, glass-like shells. Curiously, these tiny phytoplankton could be harboring the next big breakthrough in computer chips. Diatoms build their hard cell walls by laying down submicron-sized lines of silica, a compound related to the key material of the semiconductor industry — silicon. "If we can genetically control that process, we would have a whole new way of performing the nanofabrication used to make computer chips," says Michael Sussman, a University of Wisconsin-Madison biochemistry professor and director of the UW-Madison's Biotechnology Center. To that end, a team led by Sussman and diatom expert Virginia Armbrust of the University of Washington has reported finding a set of 75 genes specifically involved in silica bioprocessing in the diatom Thalassiosira pseudonana, as published today in the online Early Edition of the Proceedings of the National Academy of Sciences. Armbrust, an oceanography professor who studies the ecological role of diatoms, headed up the effort to sequence the genome of T. pseudonana, which was completed in 2004. "The semiconductor industry has been able to double the density of transistors on computer chips every few years. They've been doing that using photolithographic techniques for the past 30 years," explains Sussman. "But they are actually hitting a wall now because they're getting down to the resolution of visible light." Before diatoms were appreciated for their engineering prowess, they interested ecologists for their role in the planet's carbon cycle. These photosynthetic cells soak up carbon dioxide and then fall to the ocean floor. They account for upwards of 20 percent of the carbon dioxide that is removed from the atmosphere each year, an amount comparable to that removed by all of the planet's rainforests combined. "We want to see which genes express under different environmental conditions because these organisms are so important in global carbon cycling," explains Thomas Mock, a postdoctoral researcher in Armbrust's lab and the paper's first author. 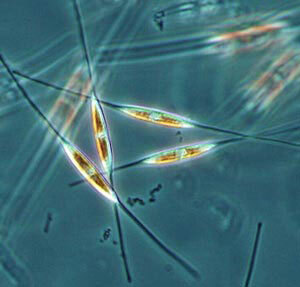 But research on these algae has uncovered other enticing possibilities. As he learned about diatoms, Sussman became intrigued by the fact that each species of diatom-there may be around 100,000 of them-is believed to sport a uniquely designed cell wall. "Now we know which of the organism's 13,000 genes are most likely to be involved in silica bioprocessing. Now we can zero in on those top 30 genes and start genetically manipulating them and see what happens," says Sussman. For his part, Sussman is optimistic that in the long run these findings will help him improve the DNA chip he helped develop — the very one used to gather data for this research project. "It's like the Lion King song," he says. "You know, 'the circle of life.'" Contributions to this paper were also made by Vaughn Iverson, Chris Berthiaume, Karie Holtermann and Colleen Durkin of the University of Washington; Manoj Pratim Samanta of Systemix Institute; Matthew Robison, Sandra Splinter BonDurant, Kathryn Richmond, Matthew Rodesch, Toivo Kallas, Edward L. Huttlin and Francesco Cerrina of the University of Wisconsin-Madison. Funding came from the Gordon and Betty Moore Foundation, the National Science Foundation, the UW National Institutes of Health Genomic Sciences Training Grant and the postdoctoral program of the German Academic Exchange Service.